The Fiat Linea is fitted with the most sophisticated electronic systems to monitor the car’s dynamic behaviour, which intervene to raise the dynamic limits even higher and to enhance safety, without being intrusive for the driver. These devices were developed by simulation and painstaking road tests to ensure that they do not detract from the pleasure of driving. The wide range of equipment is described below. In addition to its excellent braking system, the Fiat Linea is also equipped with one of the most advanced ABS anti-lock braking systems on the market, complete with EBD electronic brake force distribution. The latter distributes the braking force over the four wheels to prevent them from locking, guaranteeing complete control of the car in all conditions. The system also adapts to the grip conditions of the wheels and the efficiency of the brake pads, preventing the latter from overheating. The sophisticated ESP system cuts in when conditions are close to the limit, when the car’s stability is at risk, to help the driver to control the vehicle. To do so, ESP constantly verifies how the tyres grip the ground, longitudinally and laterally, and if the car does skid, it intervenes to recover the trajectory and the stability of the trim. It incorporates sensors that measure the vehicle’s rotation around its vertical axis (yaw speed), the lateral acceleration and the steering angle set by the driver (which indicates his chosen direction). It then compares these data with the parameters processed by a computer and uses a complex mathematical model to establish whether the car is taking a bend within the grip limits, or whether the front or rear is about to veer (understeer or oversteer). To bring it back to the correct trajectory, the system generates a yaw moment opposite to the one that caused the instability, singly braking the appropriate wheel (nearside or offside), and reducing engine power by adjusting the throttle valve. This is where the device developed for the Fiat Linea differs from other systems. Its action on the brakes is modulated to be as gentle as possible (therefore without disturbing the driving), and the reduction in engine power is limited, to guarantee excellent performance and enjoyable driving at all times. ESP is always engaged. ASR (Anti Slip Regulation), which optimises traction at all speeds, using the brakes and engine management, is an integral part of the ESP system. Based on the number of wheel revs calculated by the ABS sensors, the device calculates the degree of slipping and activates two different control systems to recover grip. When an excessive demand for power causes both drive wheels to slip (for example when aquaplaning or accelerating on an uneven, snow-covered or icy road surface), the system reduces engine torque by decreasing the throttle valve aperture and thus the air flow. If only one wheel slips (for example the wheel inside a bend following acceleration or dynamic changes to the load), this is automatically braked without the driver having to press the brake pedal. This obtains an effect similar to that of a self-locking differential, enabling the Fiat Linea to tackle road surfaces with poor grip without any difficulty. ASR is engaged automatically every time the engine is started, but can be excluded by a switch on the centre console. It is only necessary to de-activate ASR when mounting snow chains, because in order to transmit torque to the ground, the wheel has to be able to “pile up” snow with small slips that the ASR system tends to avoid. The Hill Holder, which is an integral part of the ESP system, helps the driver during hill starts. It cuts in when the ESP control unit perceives a difference in the inclination of the car through a longitudinal acceleration sensor on the floor under the front passenger seat. During a hill start, the control unit prepares to act when first gear is engaged and the brake and clutch pedals are depressed. The pressure on the front brake callipers is maintained for about 1.5 seconds after the driver removes his foot from the brake pedal, allowing him to set off without difficulty. The Hill Holder is not activated when the car is started downhill with first gear engaged. The same occurs when reverse is engaged: the system is activated for downhill starts, and it is not activated for uphill starts. And finally, there is the option of HBA, electro-hydraulic brake assistance, which automatically increases the pressure on the braking circuit during panic braking. This device, also an integral part of the ASR system, acts when there is a sudden change of gear when changing down, to return torque to the engine and prevent excessive dragging of the drive wheels, which could cause the car to lose stability when grip is poor. 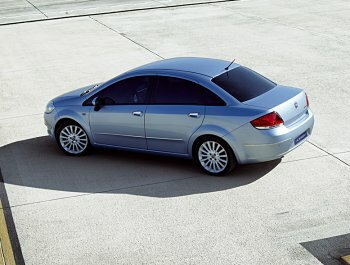 The Fiat Linea is one of the safest cars in its segment. Total protection, which starts with the devices that are dedicated specifically to safety: as many as 6 airbags, two of which are of the multistage type, three-point seat-belts with pre-tensioners and load limiters, five head-restraints and the FPS fire prevention device. Then the new chassis, which was designed to absorb any impact very effectively. And finally, the contribution made to occupant protection by the bodywork, the bonnet, doors and facia crossbeam. Nor can we overlook the contribution made to passive safety by other elements such as the seats or the steering column, which were designed taking their behaviour in an accident into consideration. Complete protection, intelligent protection. In a head-on impact, occupants are protected by an innovative restraint system known as ‘Air-Bag Smart 2’, because it automatically adapts the activation parameters according to the severity of the accident. Starting from two front airbags for the driver and passenger, which adopt a different logic from conventional airbags. Until now, when the airbags were activated, they inflated simultaneously up to their maximum limit, which was established to safeguard occupants during severe impacts. The Fiat Linea, on the other hand, adopts front airbags with dual-stage activation; this means that the system only activates the first of the two stages when the impact is of moderate strength, but activates both in the event of a more serious collision. The two stages can also be activated with different sequences depending on the type of impact. In any case, the bridles inside the bags guarantee that the maximum dimensions and the shape taken by the cushions are as non-invasive as possible for passengers. The front passenger airbag can obviously be de-activated (using the menu on the control panel), so that a child can be carried in a safety seat facing backwards on the front seat (the pre-tensioner on the other hand remains active). The sensors of the ‘Air-Bag Smart 2’ system also control the activation of the seat-belt pre-tensioners. The Fiat Linea is fitted with front seat-belts that are each complete with an inertia reel, pre-tensioner and load limiter. On impact, the electronically controlled pyrotechnic pre-tensioner retracts the belt in a few milliseconds, so that it adheres perfectly to the body. The load limiters are positioned inside the inertia reels, and they yield in a controlled manner, metering the force exercised by the belt on the shoulder of the person wearing it. The optional curtain-bags are airbags that descend along the windows to protect occupants’ heads in the event of a side-on collision. The curtain-bags adopted on the Fiat Linea are more protective than other systems (because they always take up the correct position), faster to inflate and less invasive for passengers. They open from the top down and there is no risk of their causing secondary injury to the occupants’ arms with their movement. They also effectively protect the heads of both front and rear passengers, because they extend the whole length of the side windows, protecting occupants even if the car overturns. The two bags (one on each side) are positioned under the longitudinals of the roof, folded inside a closed compartment. At the appropriate moment, the cover bends to allow the bags to inflate and to descend. And finally, to protect the pelvis and chest of passengers even if they hit the sides of the car, the Fiat Linea also fits sidebags inside the seat squabs, where they protect the occupants best, regardless of the latter’s stature or position, or the seat regulation. The new car was subjected to possible types of high speed collisions in order to verify on the spot the effectiveness of the integrated protection system developed. The results were then analysed on the basis of the structural and biomechanical parameters envisaged by some of the world’s most stringent legislation. 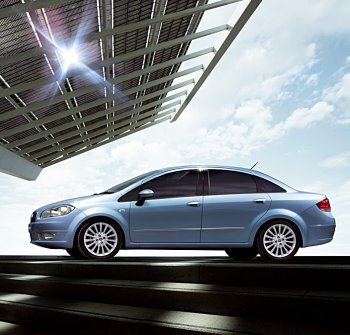 The styling of the front part of the Fiat Linea was developed bearing the protection of pedestrians in mind. The volumes are smooth and rounded, and there are no sharp edges that could injure pedestrians. The large surface of the bonnet minimises the risk that a pedestrian’s head could hit the front uprights. The sturdiest components in the engine bay are positioned at a suitable distance from the bonnet, to allow the ‘skin’ of the bonnet to absorb the energy deriving from impact with a pedestrian’s head better. The new model also features all the devices that guarantee absolute safety for children travelling in the car. The most important, and most effective, of these are the Isofix attachments on the rear seats, and the de-activation of the front passenger airbag by the onboard computer.